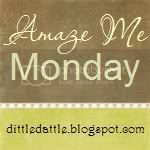 Bits & Scraps Of My Life: What a wild ride of a Monday!! What a wild ride of a Monday!! by Kroger before picking the boys up. Needed bread and milk and a scrap mag......lol. So I get fairly close to the store and traffic is bumper to bumper and at a stand still. So I figure there is probably a wreck. I finally get to where I can pull into the Kroger parking lot and there is barely anyone there.......YAYYYY!! I don't have to fight for a close spot to park in the rain!!! SWEET!!!! 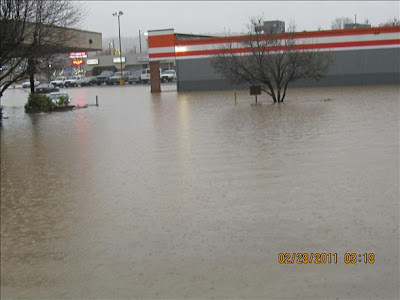 I head to my fave area to park and look straight ahead at the road that is facing that part of the lot.........um, wait....there IS no road!! River is more like it! Now, where I came in was off of a main road....not at a light. So now I am in the parking lot, its pouring rain and all the other entrances that have lights are blocked by flooding. Not just standing water.......FLOODING!!! See? See those cars??? That's on the opposite side of the parking lot!!!!! I said screw bread and milk and headed back to the school to get my babies!!!! Unbelievable!! And Bob was stuck across town.....he didn't know anything about the flooding either. So I got the kids and called him telling him they had closed the interstate down.....we weren't even sure he was gonna be able to make it home!!! And Matt was at his school, which is ALL the way across town and you have to get there via.........yup!! The interstate!!!! I'm guessing the driver knew a back way cuz Matt did make it home after 6 pm. And Bob made it home safely too.....whewwwww!!! And I don't think I mentioned our Ipod drama over the weekend either.......Jacob has been working out with the football team. We have a new coach this year and he wants to play so he is going thru conditioning with them. Well....apparently this kid had a $300 iPod and no place safe to put it...so he had Jacob put it in his backpack. Well, the boy left before Jacob could give it back......that night Jacob is in awe of said iPod and sits there playing with it and oohing and ahhing over it.........sorry kiddo.......I don't have one...so you don;t get one either!!! LOL. Swears he put it in his backpack and the next morning he gets to school, finds the boy, reaches in and............nuthin!!! EEEK!!!! Now, we have had problems with my 10 year old having sticky fingers. He stole a MP3 player at school and got bold and even swiped a sub's cell phone right off her desk. Caught both times (duh!!! this kid watches cops for goodness sakes he oughta KNOW he will get caught!!!) So Jacob accused Brandon of stealing it. And with Brandon's history, of course I wasn't so sure myself. On Saturday we did a room search and found nothing.....house search.......nothing.......car search......you see where I'm goin with this I'm sure! So I start calling his friends and asking if anyone has been given an iPod. No, but I did find out he was supposed to trade "something" with a boy for a pocket knife.......and he swears he has no clue what this kid is talking about....yeah right!!! So it's looking more and more like Brandon is in this up to his beady little baby blue eyeballs!!! I emailed the teacher to see if one had been confiscated at school or if he had been seen with one. Nope!! Once we got home I told Jacob to do another sweep of the car and Steven to clean and look in their game room. It was trashed anyway, so he could do both things at the same time. He pulls up a couch cushion in front of the XBox and there is the mythical iPod!! UGHHHHHH!!! I wanted to kill him!!!! Steven showed it to him and he SWORE someone hid it there. Yeahhhhh he couldn't just have CRS like his mom now could he???? He yelled at everyone and I told him to be thankful rather than act like an ungrateful turd. He's 15 and apparently that is just about all 15 year old boys know how to be. Is there a point to my story? YES!!! Brandon and I BOTH learned something very important!! I apologized to him. I felt AWFUL for treating him the way I did and not believing in him. So apologizing was something I just had to do......as hard as it is to admit I'm wrong it's just as important for kids to see that mom's screw up too. Its part of being HUMAN. But when you do screw up you gotta take ownership and do the right thing! Brandon learned that when you arent honest and you do dishonest things, people lose faith and trust in you. And it's actually a sick feeling to know that you are right and not have anyone believe you. You have to work to regain that trust and it takes time.......and sometimes you will get blamed just because you have that history. But the truth will prevail and come out!! A growing up experience for us both! Now if Jacob would just stop believing he knows it all we will be good to go :) Hey...I can dream can't I???? K....I did warn you this would be long!!!! As some of you know....my cousin had a baby a few weeks ago. She and I reconnected on facebook after having just met each other once when we were both kids. I wanted to make her something when she had the baby....I have been stealing her facebook photos of the baby to scrap.....lol. I waited and waited for the perfect kit!! Nevaeh's room is done in pink and black (by the way....her name is Heaven spelled backwards...cool huh??) Finally along came Echo Park with Be Mine!!! LOVEEEEEEEEEEE this line even with all the pinkness!! (5 boys here....no pink scrap paper....lol) So I ordered and finally got it last weekend! So this past weekend I sat down and decided to alter a frame. Quite some time ago I bought this beauty at Goodwill. Yeah I know!!! Ain't it awful?? LOL And I bought the set!! One was this rooster and one was a cow...and they are 3 D too.....Oooooooooooohhhhhhhhhhh!! Yeah I put up with a lot of "What the hell's????" from my family. But I hoard pringles cans remember? So they know I ain't right.....lol. The set of these was a buck. The frame is really a nice chunky shadow box. And that yucky table it's sitting on is a future project as well.....lol. I couldn't get my stupid paint can to spray......so I tried inking it with a black ink pad. AWFUL!! 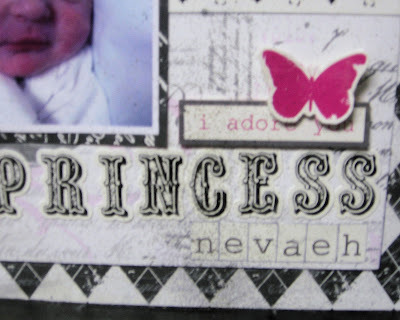 Finally I conceded defeat and did what I shoulda done in the first place, MOD PODGE!!!!! And tada!!!!! From icky to incredible!!!! 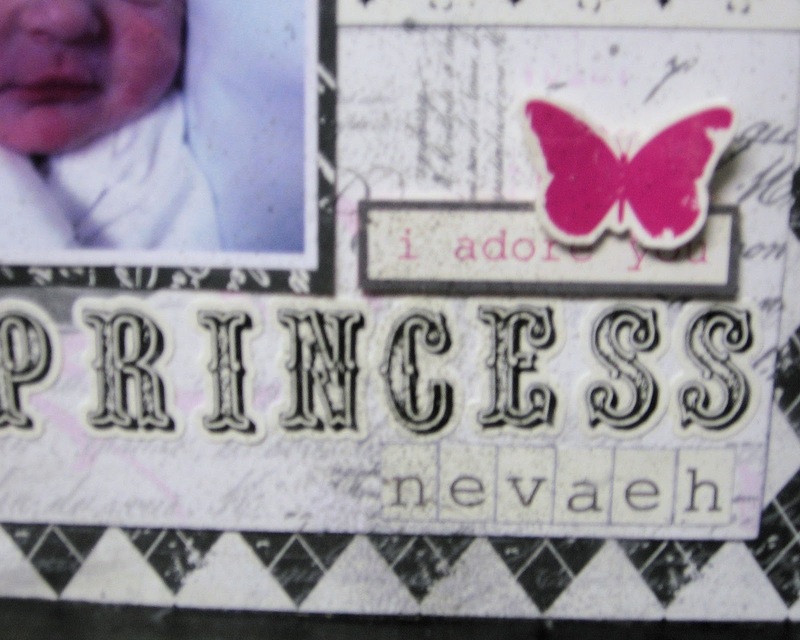 Here is a closer look at the tag....I worked on this today cuz it just needed some oommph!! I didn't have the taggy completed yesterday but I did share the first photo on facebook........did I mention that yesterday happened to be my cousins birthday? I had no clue!! But how cool that I finished it on her birthday! I just wish she lived down the street rather than wayyy up yonder in Ohio so I could just walk down and give it to her along with a big ol hug!!! Love you Tonya!!!!! Happy Birthday sweety!!!! I love how it all matches......lol. 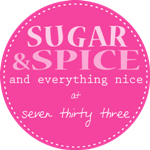 Bare with me a little longer cuz I have lots of awesome places I am linking up to today! And someone tell Echo Park they need to put this on their blog!!!! LOL. I am trying soooooo hard to get a project featured over there!! 8.And an awesome place I just found to link your blog and make new friends! Whewwwwww! I love it when I can share so many places!!!! Please drop me a comment and feel free to become a follower.....I am so desperate for adult interaction........lol. Holy flood!!!! Thanks for participating in the Good Friends Just Click Blog Hop! New follower! I have lots of giveaways ending Thursday, hope you'll stop by! Great post! I SO know what you mean about adult interaction! lol LOVE LOVE LOVE the frame you did!!! Gorgeous! Post it on Echo Park's Facebook Wall. 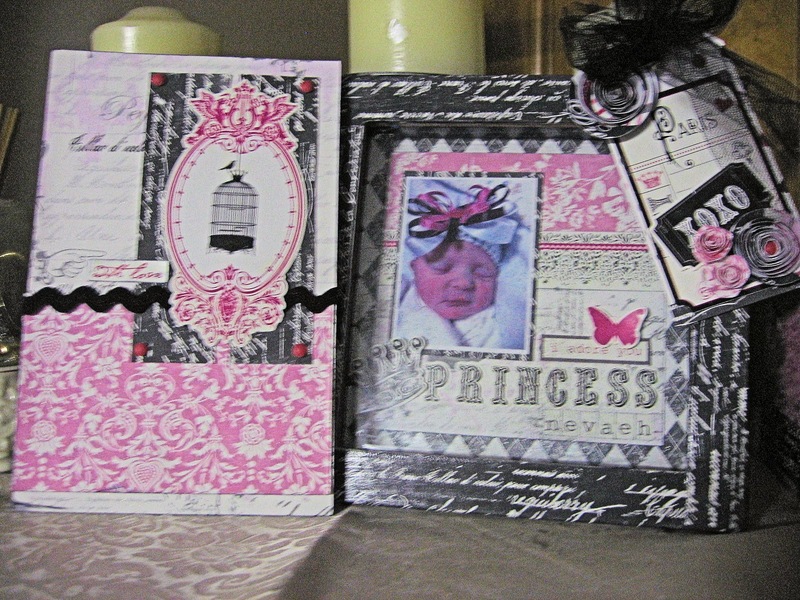 I did that with a card I made recently with their paper. It's a great project! All I can say is raising kids is hard! Hi there! 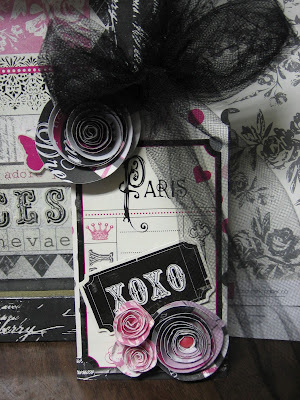 Thanks so much for stopping by the Spring Fever Blog Hop - I hope you enjoyed looking around! I am happy to be your newest follower! WOW - it's awesome! Thanks for joining us at Do You Stack Up. 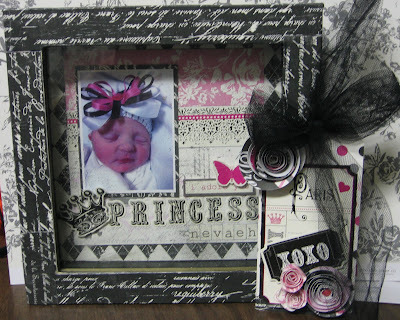 oh so glad you posted more pictures of your awesome frame project. The pp mod podged to the frame is way cooler than painted black, now aren't you glad that spray can clogged?!?!? I adore your rolled flowers and the matching card. This whole project just turned out incredibly awesome - congrats girl! Well, I would have to say that you do indeed live an interesting life . kids, floods and all LOL! But I love your project and bet she will too! 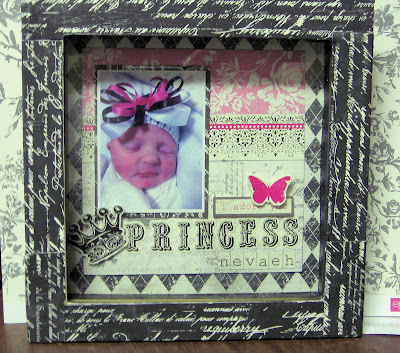 I'm sure your cousin will just love receiving the photo box frame, its totally cute! 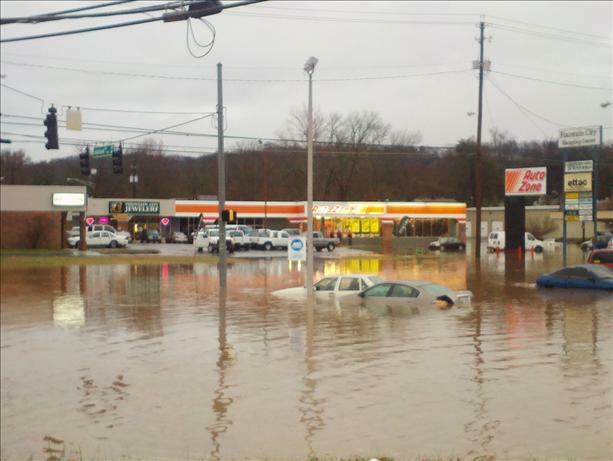 And that flooding, oh my gosh, just crazy! WOW, sweetie!! And I thought my life was hectic!! I'm so glad that you and your family made it home from the flood... That's scary!!! And I'm also glad the ipod incident turned out well!! Tina, your altered frame, tag and card are gorgeous!!!!! I'm sure your cousin will love it!!! Hugs!!! I think your frame is BEAUTIFUL!!! What a cool card too! Sooo glad you found the ipod! What a rough Monday!!! Wow, I hate weather related nasties. What a large flood. Yikes. Hope your week is now going better. Your project turned out wonderful! Such a cute little subject. 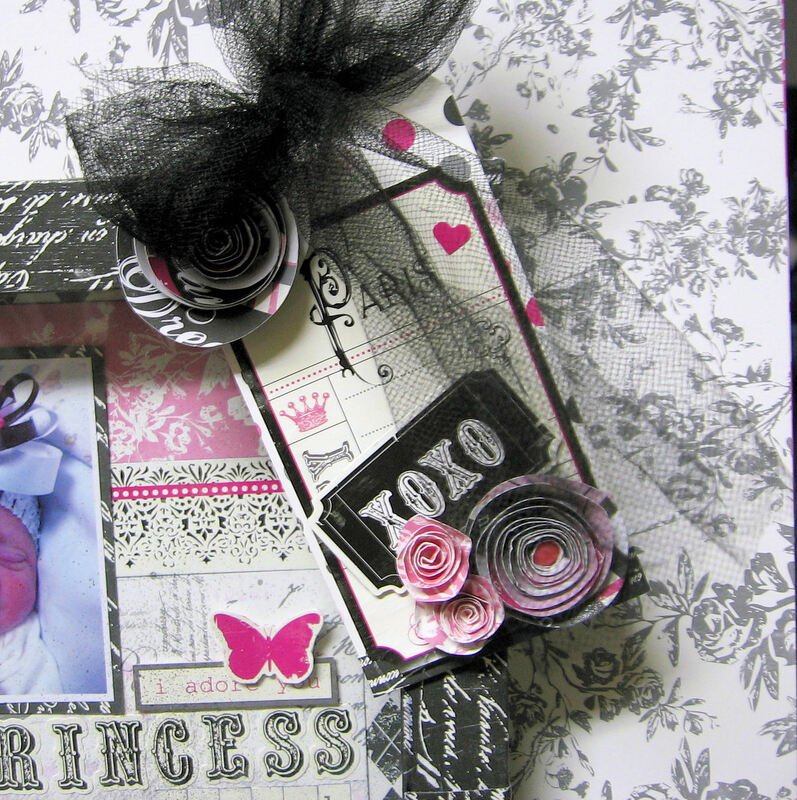 Such a stunning shadow box in that chic black and pink colour palette ! Gor-juss! Love the tag and your design..tres jolie! :) Thanks for linking up at Paper Issues! Love it! It's precious, glad you could link up to Paper Issues!